For Key Stage 2 ‘Swift Nicks’ Nevison bursts into the classroom on the run from a hue and cry, looking for his good friend the teacher and hoping for a place to hide for the day – very exciting and immediately involving. After telling tall tales of his exploits, he asks the children to ‘correct’ documents written about him, based upon what he himself has told them. The work is differentiated to suit all levels of ability: a ballad, a news-sheet full of adventures, a London Gazette Wanted Notice, and a false description to mislead the local watchmen. While the class works, Nevison visits the children in their groups, teaching card games, playing dice or nine men’s morris, counting his ‘ill-gotten’ shillings and half crowns, etc. Finally he tells the story of his most famous exploit. Children become very caught up in Nevison’s world. This visit is focused on Years’ 4, 5 or 6 Literacy. Several schools regularly use this character to add detailed background and an exciting experience to the children’s study of “The Highwayman” poem. Others use this as part of topics such as Journalistic Writing, Persuasive Writing, or Myths and Legends. It can be a cross-curricular literacy – history session if combined with a study of ‘Crime and Punishment’ beyond 1066, which is the example given in 2014 History Curriculum. For KS3 Nevison can be an involving and exciting part of ‘The development of Church, state and society in Britain 1509 – 1745’ , giving an interpreted insight into the criminal side of late seventeenth century society, as well as its laws and punishments. A day with a Highwayman! Eynos is a late Elizabethan ship’s captain who traveled with Sir Walter Ralegh on his quest for the fabled city of El Dorado. He takes the children on an imagined, role-played journey through the forests of Guiana to create their own exciting and eventful story, which they can write down later. Listening, speaking, co-operating and decision-making skills are all exercised, and a different tale emerges with each class. Eynos can also discuss seafaring in particular or the Elizabethan period in general. If your children are studying seafaring or exploration then this visit is perfect, but as it does not require them to have previous knowledge, it works very well as a stand-alone Literacy exercise – a creatively fun adventure in an imagined world. Afterwards, the children enjoy retelling their story, especially what happened to them as individuals. If there is time, for example if I work with one class for the day, Captain Eynos can demonstrate a collection of strange navigational instruments, describe life aboard ship (or on land), and tell tales of famous events like the defeat of the Armada, or of famous seafarers such as Drake and Ralegh. (Note: I am currently working on a new seafaring character – one of Drake’s sailors who circumnavigated the globe with him. This character will suit the KS1 history topics of significant events and significant individuals contributing to national and international achievements. That session would make a good contrast study if the children are to look at a more modern explorer or traveler.) For Key Stage 3 my Elizabethan seafarer can vividly describe famous Elizabethan events such as the defeat of the Armada, Drake’s circumnavigation and/or Ralegh’s attempts to find El Dorado, the city of gold, thus bringing out aspects such as the conflict with catholic Spain and the true (piratical) nature of seafaring exploits at the time. 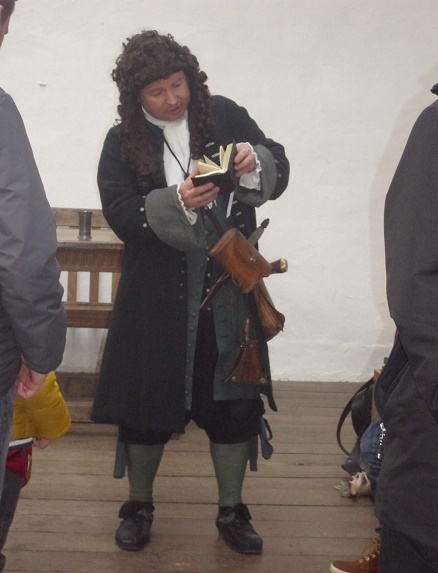 As well as telling the children about the civil war in their locality, Obadiah tells of his own experiences, and can engage in a wide-ranging Q&A discussion of seventeenth century life in general. Topics range from mundane, day to day aspects like diet and travel to religious beliefs and the government, as well as his ideas concerning the causes of the war and famous people. He can demonstrate the use of the musket (not actual firing! ), describe his other possessions, teach the children marching drill in the yard, and give an account of various battles, perhaps employing children to represent the units involved. 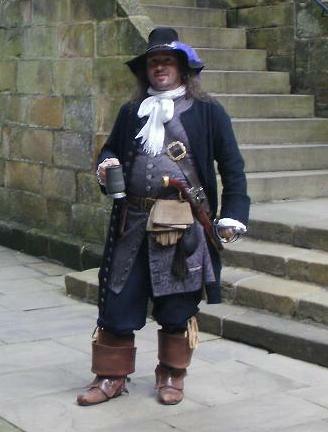 See the Castle Governor and Civil War Battles for other English Civil War related sessions. As a politicised New Model Army soldier, Obadiah can also talk to KS3 pupils about the radical ideas addressed at the time (such as during the Putney debates). He can discuss the war, tactics, strategies and personalities in more depth, as well as why he and others have gone to war, thus suiting the curriculum example of ’causes and events of the civil wars throughout Britain’. Life in the civil war! Sir William Petty is a rather famous gentleman who, being a founder member of the Royal Society, knows the king and many other famous folk (including Samuel Pepys). Recently several of his London properties were burned down during the Great Fire. Petty tells the full and exciting story of the terrible calamity during which the children join in several activities, such as working out how to form a bucket chain and becoming houses in an experiment to see how easily the fire spread. Sir William can ask the children to help him draw a map of the new London, each child having their own little parish to re-draw which then all join together to form one large map that everyone has contributed to. This session, which has been tested in a school, will be properly ready very soon, once I have done a little more learning, note-making and tweaking! This early 18th century pirate tells stories about buccaneers and pirates from the famous Henry Morgan to the infamous Blackbeard, from the terrible L’Ollonois to the cunning Jean Doublet. Children love stories about pirates. This character can work with the whole junior and/or infant school by moving from group to group in approximately one hour sessions to tell tales of Caribbean sea rovers, answer questions about pirates’ ships and lives, and demonstrate the artefacts and weapons he is carrying. Or he can work with just one or two classes for an even more involving day, with enacted stories and more discussions. KS3 pupils will discover a more historical version of pirates compared to those portrayed in books and films, how the reality was often brutal and very cruel, yet no less full of adventure. This character vividly elucidates upon several social and economic aspects of the early British Empire, especially the ‘Golden Age’ of piracy which troubled the American colonies in the early 18th century. This fellow can be one of several possible men – most often the governor of Sandal Castle, Pontefract Castle, Skipton Castle or Helmsley Castle. Like Obadiah the musketeer (see above) he talks about the British civil wars, but with his own slant on experiences, concentrating on siege warfare and local events. He’s a great choice if your school is near one of these Yorkshire castles, or perhaps another site involved in the Civil War. This gentleman can talk to KS3 pupils about the radical religious and political ideas of the Civil wars, discuss the causes and course of the war in depth – the battles of the mind as well as on the field. This is not actually a character session, instead it is an involving and fun local history lesson using a large map and painted toy soldiers to teach about the 1643 English Civil War battles of Wakefield or Heptonstall. In the first, Sir Thomas Fairfax and 1500 Parliamentarian soldiers faced George Lord Goring and 3000 Royalists; in the second a small force of Roundheads took on Major General Sir Francis Mackworth’s force of Cavaliers. The children begin by learning about the local terrain, the soldiers involved and their weapons. Then they divide into groups to write their battle plans, after which we fight the battle to see what would have happened had your children been in charge! Finally, now that the children have an understanding of what everything represents, we end the session by seeing what actually happened in 1643. The lesson takes half a day, and so can be done with two classes in one day. A battle in the classroom! For obvious reasons, this is my special character for the middle of Autumn term. Guy Fawkes most often visits Key Stage 1 children, often both Years 1 and 2. We start with an assembly (perhaps with the Key Stage 2 children also present) in which I introduce myself and then, with the help of the children to act out the roles, I describe the Gunpowder Plot in detail. The day then continues with sessions for individual KS1 classes involving demonstration, question and answer, as well as several activities – writing in a secret cipher and playing ‘hide the priest’. These activities help the children to understand aspects of the plight of Roman Catholics in the period. Fawkes is also very suitable for KS3 visits, especially the curriculum example of “conflict with Catholics”. It vividly explores what drove Fawkes to take part in such a horrendous plot, describing the dashed hopes and suffering of English Catholics under Elizabeth and James, and all the difficulties endured by the Jesuit and Seminarian priests. He can talk about his fellow plotters and what exactly they intend to do. Considering the nature of the Plot, I am happy to come out of role near the end of a session to talk as a historian to the pupils about the character, considering his beliefs and attitudes from ‘another angle’. A day with Guy Fawkes! Master Laurence tells of Sir Francis Drake’s exciting and eventful three year journey around the world – the first Englishmen ever to do do so. The story is full of curious encounters, terrors and hardships, but has an ending that would make nearly every subject of Queen Elizabeth very happy indeed. The children get to see all sorts of artifacts, with supervised handling too. Can they guess by smelling what spices were brought back? Can they tie sailors’ knots? Can they wield a musket? Can they fathom how to use the navigational instruments? This day works well with two classes, but with one class even more activities can be incorporated into the story. (Available by special arrangement.) 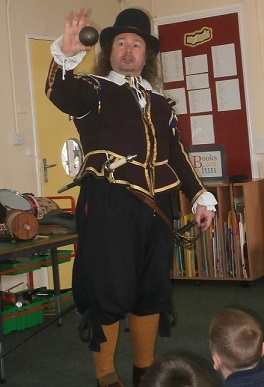 How exciting would it be to have an eccentric, time-travelling gentleman from 1674 arrive at your school for the day, hoping to discover all he can about the modern age? What can your children learn about his time, and what can they tell him about their own world? What strange artifacts is he carrying? And why did he think he might need them? What stories can he tell them, and what marvels can the children describe to him? Is the modern world better than his own time? Sir William Petty is a natural philosopher and a member of the famous Royal Society. Having invented all sorts of curiosities, he has now embarked on the most ambitious (and secret) experimental adventure of his life – to travel forwards in time through hundreds of years. Fearing that England might have become a dangerous place, filled with war, disease, wild animals or bands of brigands, how happy will he be to find a civilised and learned world? And how lucky he will be to arrive at a school filled with scholars and experts happy to help him learn as much as he can? A Time Traveller in School! Thank you for a brilliant day and really bringing our pirate topic alive! The children actually still believe that you are a real pirate!